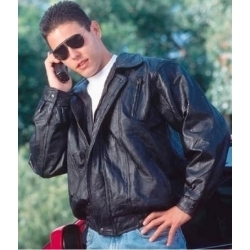 THIS JACKET IS ONLY AVAILABLE IN SIZE LARGE!!! 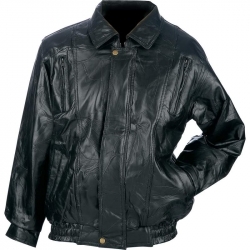 The Maxam(R) Brand Italian Mosaic(TM) Design Genuine Top Grain Lambskin Leather Jacket was designed with two goals in mind: style and comfort. Features adjustable wrist snaps for added comfort. Plenty of space for your belongings with two zippered chest pockets, two slash pockets, and one inside pocket for your wallet, sunglasses, or cell phone. Only available in XL !!! 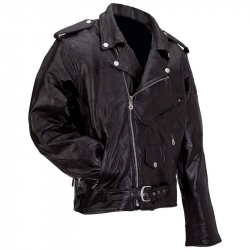 Napoline(TM) Roman Rock(TM) Design Genuine Leather Jacket features 2 large front snap pockets and snap closures at the wrists. Fully lined. 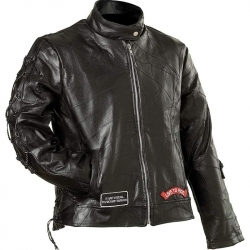 Diamond Plate(TM) Rock Design Genuine Buffalo Leather Motorcycle Jacket features a zip-out liner, silver-tone hardware with matte buttons, zippered back vents, zippered wrist panels for covering gloves and adjustable side laces. Shoulder epaulets, collar, and lapel feature snap down buttons. 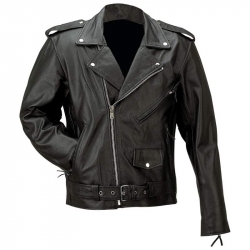 Diamond Plate(TM) Men's Hand-Sewn Pebble Grain Genuine Buffalo Leather Jacket features eagle patch on the back; zip-out polyester lining; gunmetal zipper and buckle with black snaps; multiple small patches; belted waist; leather laces; snap down collar; slash pockets; and snap epaulets on the shoulder. 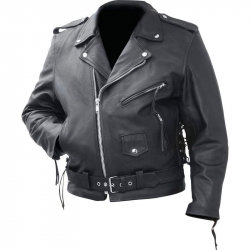 Diamond Plate(TM) Rock Design Genuine Buffalo Leather Motorcycle Jacket features zip-out liner, silver-tone hardware with matte buttons, zippered back vents, zippered wrist panels for covering gloves, and adjustable side laces. 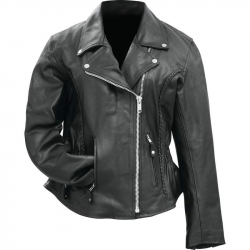 Diamond Plate(TM) Ladies' Rock Design Genuine Buffalo Leather Motorcycle Jacket features multiple Live To Ride(R) brand embroidered cloth patches on the front and back. Nehru collar with snap closure. 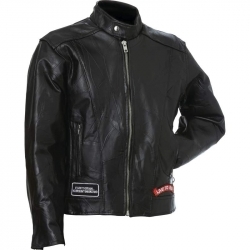 The zipper front and leather side and sleeve laces allow for an adjustable fit. 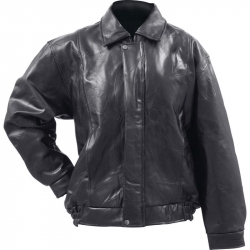 The Diamond Plate(TM) Rock Design Genuine Buffalo Leather Motorcycle Jacket features genuine buffalo leather construction, a Nehru collar, zippered wrist closures, zip front, and a nylon lining. 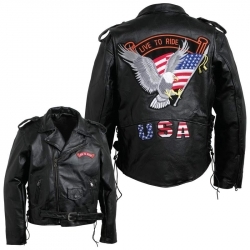 The Live to Ride(R) embroidered cloth patches are sewn in place for you for instant ready to wear. 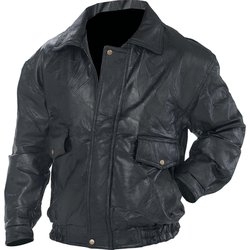 The Maxam(R) Brand Italian Mosaic(TM) Design Genuine Top Grain Lambskin Leather Jacket features adjustable wrist snaps for added comfort, 2 zippered chest pockets, 2 slash pockets, and one inside pocket. 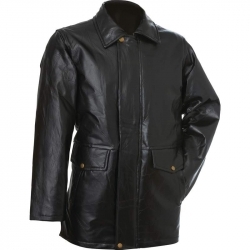 When a jacket isn't enough, the Giovanni Navarre(R) Italian Stone(TM) Design Genuine Leather Trench Coat will easily hold off the elements. 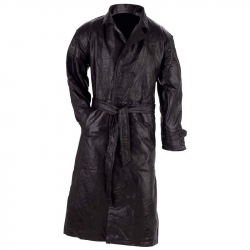 This fully lined trench coat will keep you warm from head to toe on the coldest of days. Ready for any occasion, the Giovanni Navarre(R) trench coat features spacious slash pockets, a discreet inner pocket, button front closure, and adjustable belt. Timeless styling in classic black, this wardrobe staple is ready for anything you are.